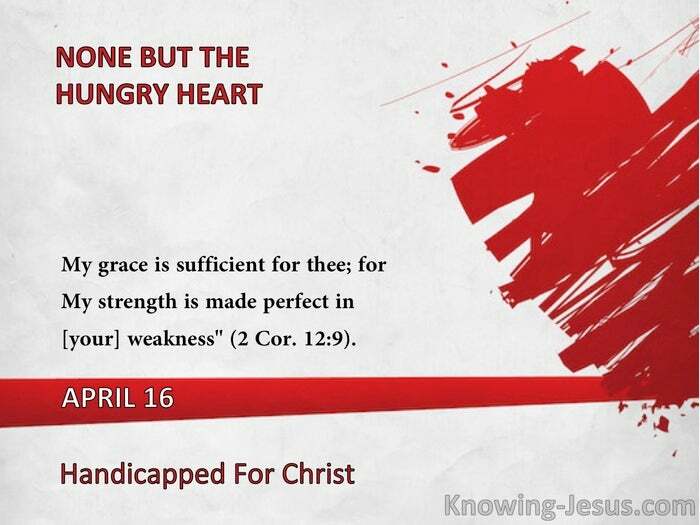 My grace is sufficient for thee; for My strength is made perfect in [your] weakness" (2 Cor. 12:9). In self we are crippled; in Christ we conquer. The secret is to face up to the former, and rest in the latter. The disadvantaged believer has all the advantage - he knows it must be "not I, but Christ." "It is a great step when the believer fully consents to his own weakness, and the abiding consciousness of it, and so works faithfully on, fully assured that his Lord is working through him. He rejoices that the excellence of the power is of God, and not of us. Realizing his oneness with his Lord, he considers no longer his own weakness, but counts on the power of Him of whose hidden working within he is assured. "It is this secret assurance that gives a brightness to his look, and a gentle firmness to his tone, and a perseverance to all his efforts, which of themselves are great means of influencing those he is seeking to win. He goes forth in the spirit of one to whom victory is assured; for this is the victory that overcometh, even our faith. He no longer counts it humility to say that God cannot bless his unworthy efforts. He claims and expects a blessing, because it is not he, but Christ in him, that worketh. The great secret of abiding in Christ is the deep conviction that we are nothing, and He is everything." -A.M.
"Not that we are sufficient of ourselves to think anything as of ourselves, but our sufficiency is of God". (2 Cor. 3:5).